Christmas in Bethlehem (Beit Laham, Aramaic for House of Laham, the Canaanitic God) is still a very special and meaningful time even under the brutal Israeli apartheid occupation. We are not talking about the visual aspects and the unique religious services at the Church of Nativity (you can now follow these live stream for example on the link shown below). It is special because reflection here is special. Nowhere is there an exhibit of “Occupation Art” shown in a “Peace Center” in front of a large Christmas tree in front of one of the holiest places in Christianity. Nowhere on earth do people pray that the wall suffocating them is dismantled then watch and listen to Christmas carols from around the world after admiring such exhibits. Nowhere can we hear the same singers mix Christmas and patriotic songs in the Manger Square and the Shepherds’ Field. Figure: teargas canisters shaped as a peace sign in Nativity Square. In my town of Beit Sahour, the Shepherds Field, we just concluded two nights of the three nights called “Shepherds’ Night”. Yesterday Reem Al-Banna the famous Palestinian singer entertained hundreds. Today a magician entertained children and hundreds of them (Muslim and Christian) received gifts from Santa Clause. 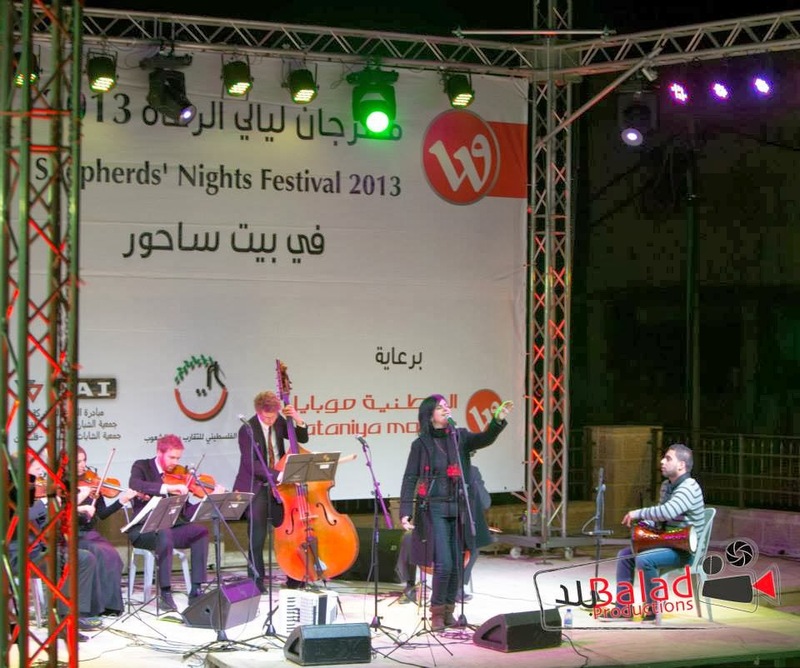 Later in the evening the crowds enjoyed the patriotic music of Thaer Barghouthi who gained fame as the musician and composer for the 1987-1991 uprising (of which Beit Sahour was then at the forefront). Tomorrow on Christmas day (Western calendar) starting at 4:30 PM we will have a candlelight march under the banner “Light a candle for Self Determination” in Beit Sahour (organized by Palestinian Center for Rapprochement Between People and the Joint YMCA/YWCA Advocacy Initiative). We demand that Bethlehem is freed from the occupation and colonization that now limits us to develop only 13% of our district. We demand the right of return and self determination for all Palestinians. The end of 2013 and beginning of 2014 is a time to reflect that some 2.5 billion human beings believe in a message that originated with a Palestinian child thought to be born in a manger over 2000 years ago. The land was called Palestine at the time of Jesus’ birth and also for hundreds of years before he was born and it is still geographically Palestine today. It is also a time to reflect on the real message of Jesus, sometimes distorted (like happened with the Crusaders and with the marginal misnamed “Christian Zionists”). It is still a message of hope, peace, joy, justice, love, and harmony. It is the busiest time of the year for us. This is a time when we are asked to speak to a lot of visiting delegations, most of them Christian pilgrims. We also get invited to all sorts of events and prayer vigils organized by many Palestinian groups (in the last few days alone YMCA/YWCA, Bethlehem University, Catholics, Evangelicals, and Presbyterians). We reflect with them on our mixed backgrounds and history and the future of our joint humanity. They all pray for people in Syria, Gaza and elsewhere where there is suffering. Gaza is 1.8 million Palestinians besieged in a semi-Arid strip. 1.1 million of them are refugees who can look across the "fence" built on their lands and see the rest of their lands and many of their original destroyed villages across this fake "border". Places like "Sderot" and "Ashqelon" after all were not empty lands before 1948 (see palestineremembered.com or Zochrot.org). 1.8 million people will soon start to starve in large scale. The UN said it is a humanitarian catastrophe and will be unlivable by 2020. Just today, on Christmas eve, Israeli forces also bombed Gaza killing at least two including a 3-year-old girl and injuring others in her family. So many Palestinians in Bethlehem and in the churches directed our Christmas gifts to people of Gaza and people of Syria. And most of us (me included) are barred from entering our city of Jerusalem which is methodically being stripped of its Palestinian population (Christians and Muslims) and isolated by walls (physical and psychological). But with all this suffering why are we Palestinians filled with hope, peace, and joy? It is because we take a long view of history. Some 150,000 years ago, humans migrated from Africa using Palestine as the passage way to Western Asia and then the rest of the world. 15,000 years ago, this Western Asian area (dubbed by the European colonizers as “Middle East”) was the center of development of agriculture and we call it the Fertile Crescent. This region was where we humans first domesticated animals (sheep, goats, donkeys) and plants (wheat, barley, chickpeas, lentils). This move from hunter-gather societies to agricultural societies quickly spread around the world. It was also a key transformation because it allowed people to have time to evolve what we now call “civilization”. Hence the first writings (also in the Fertile Crescent) and the first thoughts of deities (Gods). Here in the Eastern Mediterranean region our ancestors were called Canaanites (hence my 2004 book was titled “Sharing the Land of Canaan”). 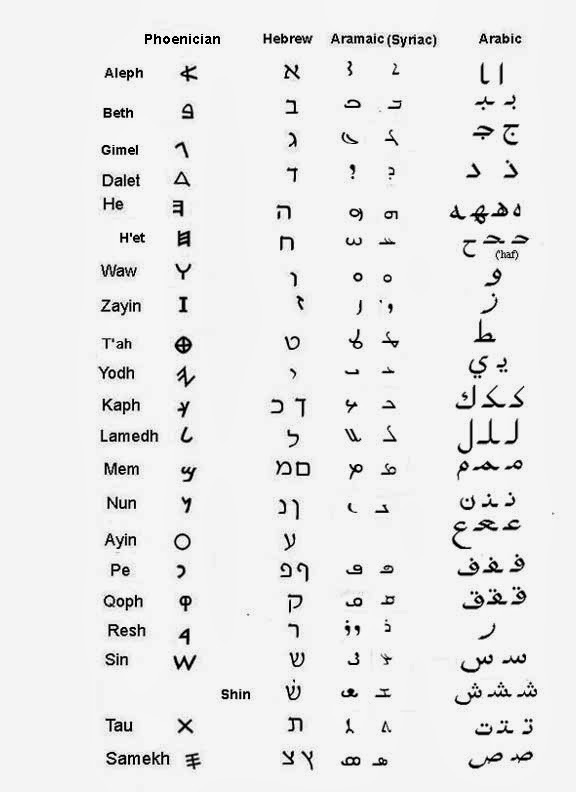 They spoke a language we refer to now as proto-Aramaic. 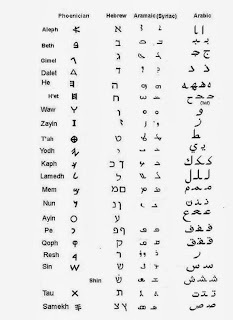 From this language and its first alphabet came the Arabic, Syriac, and Hebrew languages and alphabets. The more advanced Aramaic was spoken by Jesus. It is closest to Syriac Aramaic now spoken by few villages in the Fertile Crescent some of them threatened (like Maaloula in Syria that briefly was over-run by Salafists zealots just this year). But also the Canaanitic Phoenicians evolved the Aramaic alphabet and delivered it to Europe and it became the Latin alphabet which is now what I am typing with. A is from Aramaic Alpha (turn upside down to be the symbol of the bull; b from beit (=house), turn to side to see a domed house, J is from Jamal (became Camel, letter hump shaped) and so on. This human connect history needs to be taught in schools as a source of hope. For the 15,000 years of civilization, there were thankfully very few attempts to transform Palestine from a mixed society of various religions and backgrounds to make it monolithic (a Christian state, a Muslim state, a Jewish state...). Thankfully, these attempts lasted a tiny percentage of our long history and all failed or are failing (Saccaries, one Islamic ruler, the Crusaders, and now the Zionists). We are grateful that in this year 2013, there has been tremendous growth of actions by civil society around the world to push for human rights and justice in Palestine, the Holy Land. This included some really significant actions for boycotts, divestments, and sanctions from Apartheid Israel. This happened even with such prestigious American societies like the American Studies Association (ASA) and the Native American and Indigenous Studies Association (NAISA). This was the best Christmas gift they could give us. Together we can create a more just and humane society. So we are happy this Christmas. I am especially blessed with a mixed family that can celebrate many holidays: my mother’s family is Lutheran (celebrate Christmas December 25) and my father’s side of the family is Greek Orthodox (celebrate it January 7), my wife is Chinese American whose family is leaning more Buddhist, my sister studied in Utah and is a committed Mormon, my son was born in Texas and lives in California, and that is just my immediate family! My extended family and my close friends cover the spectrum of all other major religions (and agnostics and atheists) and backgrounds. My grandparents were born in a world that did not have fax machines, phones, cars, airplanes, or emails (let alone Facebook!). The world was disconnected and full of diseases with no cures. Life expectancy was short. Children here in Palestine were sometimes not named until they were 2 years old because most of them perished before then. One of my grandparents lost his parents and siblings within a span of three years (1914-1917) and was an orphan. Even though things are very difficult now in Palestine, the Holy Land, we have to remember that 12-15% of the native Palestinians perished in WWI and between 1936-1939 nearly 10% of the native Palestinians (Christian and Muslim) were killed or injured. Today many people grumble a lot but we are more connected than ever and we hold in our (people) hand more power than we ever had before. History teaches us that injustice cannot last long especially when so many people join the struggle. The thousands celebrating in Bethlehem tonight give us hope. Merry Christmas everyone (and we do mean every human being on earth). On good news, the success of mass demonstrations against the Prawer-Begin plan to ethnically cleanse 40,000 Bedouins of the Naqab (Negev) forced the Israeli government to back down. This should give us pause to think about strategies of liberation (besides endless negotiations). There are also other successes namely growth of the boycotts, divestment and sanctions (BDS) movement (see below). And Palestinians continue to miracles with little resources in their own communities despite incredible odds. For example, today we had a conference to discuss the future of the Faculty of Science at Bethlehem University and attended by community leaders in and outside the university. It was an inspiring event held as part of a series of events commemorating 40 years of Bethlehem University and as preparation for a significant expansion of the University. We can indeed challenge occupation and transform challenges into opportunities (freeing our minds before freeing our bodies!). In telling the story of how he himself went from being a diehard supporter of Israel, from someone raised in a Reform Jewish household who saw Israel as that plucky little democracy trying to provide a secure home for the long-beleaguered Jews to someone who now supports the Palestinians in their struggle for justice, he provides us with an inside look into the mind of a Zionist -- his own -- and how being confronted with the more grim reality changed his mind and the reality of the Palestinian struggle. American Studies Association the largest scholarly association dedicated to American Studies voted to endorse a resolution supporting the boycott of Israeli institutions of higher education. It's been a great week for Israel in the US Congress this week. But not for the American taxpayer. While many Americans are gearing up for the Christmas holidays and trying to earn the money to buy their children presents, and while the number of Americans applying for unemployment benefits surged, Congress voted yet more money to Israel. ACTION: Open Letter to boycott a cinema studies conference scheduled at Tel Aviv University for next June. Below is a link to the letter and a means to sign it. We hope you will add your signatures--and share the links widely with friends. It is snowing here in Palestine. My visitors from Gaza (a child being treated and his father) wish to go back to their family even though their wife tells us that they have no water and no electricity and that parts of the refugee camp that they live in is flooded (in Rafah). But we are all concerned for the even more precarious position of refugees from Syria (both Palestinain and Syrians who esca[ped the fighting and now live in tents in a snow blizzard). The denial of Palestinian rights to please Israel seems to know no boundaries. The World Bank just sent a press release (available in Hebrew and English but not Arabic at the world bank website). The release hails the signing a Memorandum of Understanding (MoU) for implementation of Phase 1 plans of the horrific Red Sea-Dead Sea project. The Phase 1 MoU was signed by Israeli apartheid minister and war criminal Silvan Shalom, by Minister Hazim El-Naser for Jordan and Minister Shaddad Attili for the Palestinian Authority. The MoU includes: a) the development of a Jordanian desalination plant in Aqaba where the water produced will be shared with Israel free, b) releases of water by Israel from Lake Tiberias for use in Jordan (Jordan will pay for it even though it is part of the 1994 agreement), c) the sale of about 20-30 million m3/year of desalinated water from Mekorot (the Israeli water utility) to the Palestinian Water Authority for use in the West Bank (this is also Palestinian water), d) a pipeline from the desalination plant at Aqaba would convey brine to the Dead Sea to study the effects of mixing the brine with Dead Sea water. My field of research focuses on environmental issues. All environmental groups (even Israeli ones) opposed these plans from the time that Israel as a colonial power tried to peddle them in the 1990s. As all colonial powers, they destroy things and then destroy in other areas. The Red-Dead Canal is it is now known intends to “save the shrinking Dead Sea”. But there are two main sources of decline in Dead Sea Water levels: A) Diversion of upstream waters which resulted in decrease in water flow in the Jordan River from 1300 million cubic meters (mcm) annually in the early 1950s to about 200 mcm and B) Dead Sea water used per year by the chemical industries is estimated at > 262 MCM. Both of these environmental problems are from Israel. Instead of reversing them, Israel (now with help of Jordanian and Palestinian authorities) intends to create a new problem. It is highly disturbing to see this trend of destruction, collusion, lack of direction, and continued people suffering. Better Six Billion than 6 Trillion! Bibi and Bandar Badger Obamam.. What the GCC/Arab League/Israeli team is asking of its western allies (meaning of course mainly the US) is to immediately fund the IF to the tune of $ 5.5 billion. This, Israeli security officials argue, is pocket change compared to the $6 trillion spent in US ‘terrorist’ wars of the past decade. In this week’s compilation from occupied Palestine: Today, a 14-year old child shot by Israeli sniper in the back in Jalazoun Refugee Camp. A Bethlehem young man was shot by the Israeli apartheid soldiers using live ammunition yesterday. Another lost his life after being in a coma for 7 months from an Israeli bullet. The Apartheid state of Israel exonerated itself from the murder of Mustafa Tamimi of Nebi Saleh so today we joined with the Nebi Saleh community to protest and also to commemorate Nelson Mandela (we carried his pictures). Our friend Ashraf from Bili’n was Mandela. We faced a barrage of rubber-coated steel bullets, tear gas, and stun grenades. Mustafa’s younger brother Udai Tamimi was shot in the face and in now in a Ramallah hospital with broken jaw. 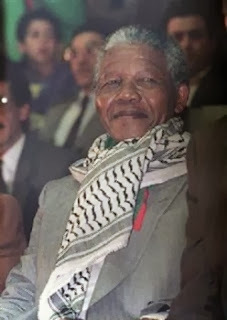 Watch what Nelson Mandela had to say in 1990 about the PLO, Yasser Arafat, and attack on him from Henry Siegman (the immoral Executive director of the “American Jewish Congress”). Christian communities throughout Palestine will hold special services tomorrow,Sunday December 8 in honor of Mandela. In Ramallah and Haifa there were conferences on nuclear weapon-free Middle East. We recalled the very close military and nuclear weapons ties between Apartheid South Africa and Apartheid Israel. And some data that is clear about the Apartheid Israel-Apartheid South Africa cooperation including on nuclear weapons. (BTW, the previous speaker of the Israeli Knesset Avraham Burg just confirmed Israel indeed has nuclear weapons). Palestinian Knesset members just urged US Secretary of State Kerry to oppose Prawer Plan of ethnic cleansing of Palestinians from the Naqab (and a new demonstration with hundreds gathered in Jaffa also carrying pictures of Mandela). “The Unspoken Alliance": Book Documents Arms, Nuclear and Diplomatic Ties Between Israel and Apartheid South Africa. Israeli President Shimon Peres has denied reports he offered to sell nuclear weapons to apartheid South Africa when he was defense minister in the 1970s. On Sunday the Guardian newspaper of London published top-secret South African documents revealing that a secret meeting between then defense minister Shimon Peres, and his South African counterpart PW Botha, ended with an offer by Peres for the sale of warheads "in three sizes." The documents were first uncovered by senior editor at Foreign Affairs Sasha Polakow-Suransky, author of the new book "The Unspoken Alliance: Israels Secret Relationship with Apartheid South Africa." On Friday, all demonstrations in many Palestinian villages had the theme against the Prawer Plan. On Saturday in 30 countries, events were held to counter the Prawer plan to ethnically cleanse 40,000 Palestinians from the Negev in the 65 year colonial Zionist program to make Palestine a “Jewish state”. The demonstrations locally in Palestine were held in Haifa, the Triangle, Jerusalem, AlBireh, and the Negeb with the same message: Prawer shall not be passed or implemented and we emphasize the unity of all 12 million Palestinians. All local demonstrations were attacked viciously by the apartheid forces. I personally noted the absence of the key symbols of the Palestinian authority which should have joined the demonstration in Jerusalem (many of the leaders have VIP cards and can travel to Jerusalem). Will these “leaders” finally listen to the people? Saturday we had a meeting to evaluate 5 years of our master of biotechnology program (joint program by Bethlehem University and Polytechnic University). Sunday, we had Bethlehem tree lighting ceremony and we welcomes a Gaza child who will be rehabilitated here (spinal cord cancer that was mostly resolved but that left the 8 year old child unable to walk). Monday we decorated a tree in the manger square with spent tear gas canisters and stun grenades (made in America, used by Israel). We posted signs that showed our displeasure at the USAID giving money to the municipality for Christmas celebrations! Typical hypocrisy of the US funding our starvation and killing while also giving symbolically to celebrations and roads to make life under occupation a bit more tolerable. Unfortunately the “Palestinian police” removed our exhibit. They act as subcontractors for the Israeli occupation preventing free speech and carry8ing out a policy of Mahmoud Abbas friendly to US policies (a policy made in Tel Aviv). The people of Nablus meantime buried their latest victim of Israeli racism. An Israeli simply shot him at point blank range. The murderer claimed he was looking for illegal Palestinian workers and that the Palestinian guy acted aggressively. Family and friends on the other hand point to the fact that this young worker was two weeks away from his wedding, had a legal job with Israelis in the area now named Ramat Gan, and had good friendly relations to Israelis who were invited to his wedding. He would have no reason to attack Israelis two weeks before his wedding. But let us face it, his killer is free and he will be added to the list of >70,000 Palestinians killed by Israel for being a Palestinian in Palestine, a country being transformed to a Jewish state of Israel. Saturday we celebrated the 4th anniversary of the launch of Kairos Palestine, a moment of truth (see http://www.kairospalestine.ps). As Palestinian Christians around the world come to this season of joy and celebration in December and January, we Palestinian Christians with help of our fellow Muslim and Jewish human rights activists remind all to work to end Israeli racist apartheid. We must end this suffering that lasted some 65 years and that left 7 million refugees and displaced people in order to create this monstrosity called the “Jewish state of Israel”, a racist apartheid state. We must evolve towards a secular pluralistic democracy with a clear affirmative action plan to restore the rights of the native Palestinians. Meeting Thursday at 11 AM at Izbet Tabib (Qalqilia district) to discuss because the Israeli military just blocked the main road to the village.